The Upper Bounce Trampoline Enclosure Safety Net with Sleeves on Top is ideal for parents that want to ensure that their children are safe while jumping on the jumping mat. The safety net completely encloses the jumping area. Furthermore, it adds an extra layer of safety to the jumping experience and prevents the accidental fallout events that can occur when a net is not present. As a parent I am naturally concerned about the safety of my children while they play outside, especially if their play activity centers around jumping on a trampoline that does not have a safety net on it. Unfortunately that was the case at my house, so I sought to change it. When bouncing on a trampoline it is important to always put safety first. A properly installed safety net creates this atmosphere without hampering the viewing experience. The mesh net is small enough to keep little people and big people alike from springing off the jumping mat and falling on the ground. Yet visibility is untouched, so the jumping experience remains fun. The net connects together in such a way that there are no gaps to allow someone to slip through by accident. 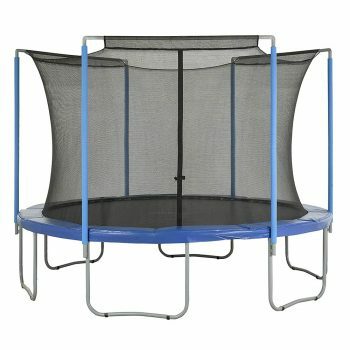 Another impressive feature of this net is where it connects in relation to the other parts of the trampoline. It connects in between the springs and the jumping mat. This adds an extra element of safety because it prevents little feet from slipping through the net and landing on the springs where numerous injuries can occur. I took measurements before I decided to purchase a net and was glad I did. So I suggest that you do the same. I will show you how to do this later. I already have poles so I did not need to order them. If you need them you will have to order them separately as they are not included in this kit. When the package arrives I inspect the contents to make sure all looks good and everything is in order. So, now I assemble the net and place it on the trampoline, step back and look it over, it is a perfect fit. Know Your Frame Size: measure your frame from one edge to the other straight across vertical and horizontal to get your frame size. For example a 12 foot frame requires a 12 foot replacement net. Choose Your Pole Structure: you may have straight poles, arched poles or ring on top. Count the number of straight poles you have. Pick an inside or an outside style net based on your personal preference. Strap Style Net Attaches with straps to the outside of the frame. Sleeve Style Net Sleeves run over poles and attach outside the frame. Determine if you need a sleeve or strap style net. If you have 3 arched poles pick a sleeve or strap style net that accommodates a 3 pole setup. Strap Style Net Attaches with straps to trampoline arches. Sleeve Style Net Attaches with sleeves running over the arches on top. Count the number of poles you have. If you have six poles choose either a net that matches a 6 pole top enclosure ring-on-top system. Upper Bounce offers replacement net enclosure parts that fit a wide variety of trampoline sizes that include pole, arch and ring-on-top styles. Furthermore, safety nets can be purchased in two styles, inside or outside net.